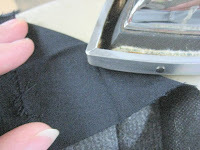 Today I tackle one of the trickiest alterations I do, shortening a vented sleeve on a suit coat. In order to be concise, I can't give you a step by step process here, but I'll hit the highlights. My goal is to get a tutorial on my website as soon as possible. Taking out the existing stitching will take a little time and care. 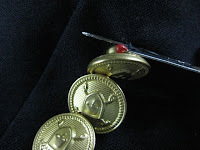 Remove the buttons and put them inside a pocket, pinning it shut for safe keeping. I always do one sleeve completely, then the other. That way I have a reference if something goes wrong. Of course digital photographs are great for reference too. I detach the lining and rip the stitching on either side of the vent. Usually one side is mitred, the other not. Once the sleeve is opened up, I can mark the new hemline. Press this into place. At this point you can shorten the lining too, but if it's an inch or less, I leave it alone. The extra ease in the sleeve in OK. The other side is much easier. You just fold right sides together and stitch parallel to the raw edge. Flip and press, making sure the two sides are now even. Lastly, I replace the buttons. 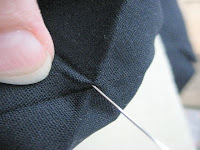 If you do this before attaching the lining, the stitches will not show. It adds professionalism to the garment. This is definitely one of my most time consuming alterations, and you can see why. Some days it goes in on the first try, but most days I have to redo that mitre several times. Don't get discouraged if you are trying this for the first time. Go to Good Will and get a jacket with which to practice. It does get easier, just not faster! But it also gives me options when shopping for my husband or sons. I can buy a suit that is on clearance, knowing I can alter it to fit. I used this tutorial with great success when I lengthened the sleeves on a number of sportcoats for my husband. Your method was so helpful that I just used it to mitre the corners on the binding of my first-ever quilt. They look incredible! The many quilt-specific tutorials I attempted before this one didn't hold a candle to yours in terms of final quality. Thank you! Thank you so much for the kind words. This blog post was rather hastily put together almost 2 years ago (yikes). It's going to be the subject of my next web page. I'll put a notification in red, on the top of this page, with a link. If you want me to notify you, go to LearningAlterations.com and leave your email address on the contact page form. And thanks again! You made my week. how much would you charge to alter the sleeves of a man's coat? Dee, It depends on the details of the coat, but generally between $25 and $35. Keep in mind I'm in the Midwest. Anyone else have any thoughts? Good luck, Sara. I am putting the finishing touches on the detailed web page that teaches this. It has over 30 steps (yikes) so it walks you through everything. I hope to have it up within the week. What part of your husband's coat are you referring to about the stitch? Just an extra step, but i find it helps a lot. Before i undo the hem on a lined jacket sleeve I tack the lining and sleeve together further up the sleeve. This prevents the danger of the lining twisting when you re-attach it to the sleeve. Thanks for your tips and tutorials! I found your blog recently and did my first waistband this past week! I had only done simple things like blind hems, slimming an unlined sport coat, and slimming legs of my trousers before, but your site gave me the needed advice and inspiration! Do you have any time to show how to do more operations on a sports coat or suit jacket? I'd like to see slimming of sleeves, lowering a collar, and slimming a jacket if you've got the time and a jacket in need of alteration. Somehow I missed the comment above from March 22, 2011. Coat sleeves can be altered the same way as Suit coat sleeves. Sometimes they are just bulkier. 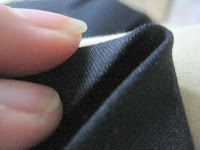 But if the sleeve has buttonholes that have been CUT, you cannot shorten from the bottom. 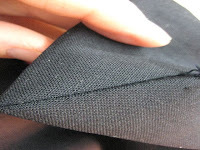 You could shorten at the shoulder, and you would have to recut the sleeve curve, you are right. It is very tricky, especially when there is padding, shoulder shaping, etc. Whew! your tutorial saved me! I've shorten several suit sleeves but this is the first time I've run into a vented one. This one has mock buttonholes sewed on. The best solution I have come up with is to remove the mock buttonholes and resew them in the new location. I think I should have charged more for this! Well, at least they were "mock". 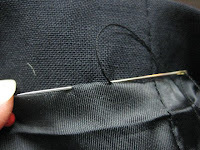 I have had coats where the buttonholes are cut through. There's not much you can do there! Oh how I wish I had a dollar for every time I said, "I think I should have charged more for this". It's right up there with, "I wish I hadn't said yes to this". I actually started keeping notes on this kind of thing so I don't get burned so often. Thanks for your kind remarks. Thanks for your interest. The rest of my website is connected to this blog, if you click on the titles on the right, almost at the top. Or you can go to http://www.learning-alterations.com. I am in the process of restyling the website, so please bear with me. If you have a question about something you are working on, feel free to click on the "Contact Me" button on the right. Hopefully I can help you with something! Thank you for this blog. I just opened a store to do my alterations after almost 7 years of sewing pioneer style costumes at the Ozark Folk Center. I did alterations as a home business for many years before that. Now that I am back into alterations, it is wonderful to see how you do your alterations. This helps me know that I am doing it in the correct way, since there is no 'school' to teach alterations. I have learned by studying how the garment was put together by the manufacturer and then striving to get it back together in the same way. I love your idea of 'taking a picture of the garment' so I don't have to leave it to memory. I appreciate the time you are taking to share your knowledge with the rest of us. Please keep in touch and let me know how things are going. You can email me at maripat@learning-alterations.com or leave a comment on the "Contact Me" page or right here! The mitred corner instructions worked for me on the first try. Thanks so much! Not only was I able to shorten the sleeve of a cheap but stylish jacket, but the weird original sleeve finish (mass-production shortcut) had enough fabric in the right places to redesign into a classic vented sleeve. Looks more expensive now, since I notice these things, and it didn't cost me any additional outlay. What an added benefit! I hadn't really thought about the fact that you could upgrade the look of the jacket by doing this alteration. Thanks for the feedback. I am working on that tutorial. I have been spending time revamping my website, so I am a bit behind on the tutorials. In the meantime, about the lining... You will have to piece it with some scrap lining. Open the sleeve lining seam up about 2 inches or so. Measure the edge of the lining, around from one side of that open seam, around the bottom, to the other side of that open seam. Cut a strip of lining. It will be 3 or 4 inches or so wide (extra length of sleeve plus hem allowance) X measurement of the edge (what you just measured). With right sides together, sew this extension to the bottom edge of the sleeve lining. Press. Resew the sleeve lining seam. Hem as the rest of the instructions show on my blog. Stay tuned. Many changes are in the works!! Thanks for your patience, too.